You are currently browsing the tag archive for the ‘Kobe’ tag. Based on the semi-autobiographical novel by Akiyuki Nosaka, ‘Grave of the Fireflies’ is a strong, emotional and immensely sad film. It kicks in right away, when we hear Seita say “September 12, 1945. That was the night I died”. What follows is Seita’s story: this boy, about fourteen, first loses his mother in the fire raid of Kobe, which destroys the wooden town completely. Then he and his little sister Setsuko try to live at their aunt’s place, but the initially kind woman grows increasingly hostile to them. So Seita decides to find his own living space for him and his sister in an abandoned shelter, first trying to get food by buying it, then by stealing. Unfortunately, Setsuko sickens from malnutrition, and while he finally has a real meal for her, she dies. Seita manages to build her funeral, but although not shown, the film suggests Setsuko’s death has broken his will, leading to his own death as depicted in the first scene. The rather straightforward story is told with several flashbacks and flash-forwards and with a unique focus on details of everyday life, which really makes the two children come to life. 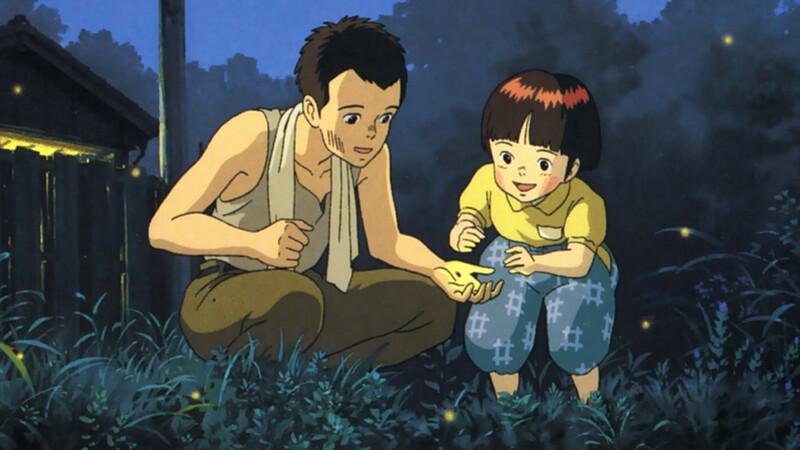 The realism of ‘Grave of the Fireflies’ is unprecedented, the animation of Setsuko in particular being very lifelike, despite a less fluent animation technique. Never before has such a realistic and endearing child entered the animated screen. The film’s subject matter, which confronts the Japanese viewer with the lowest point in their recent history, is daring and so is its execution, with its concise focus on human suffering, instead of heroism or action. The film makes the viewer really feel the impact of war on innocent civilians: the agony of shortages, hunger and despair, while the rest of the war remains at the background. Takahata focuses on Seita’s love for his little sister, and his struggle to shield her from the effects of war. Seita is a sympathetic character, but not without flaws. His struggle to survive and to nurture his sister is heroic, but his decision to leave his aunt is also iinduced by pride, and it’s partly his own stubbornness that prevents him from reconciling with his aunt, which may have prevented Setsuko’s death. It’s hard to blame him, though, for he’s a child himself, after all. ‘Grave of the Fireflies’ is one of the most serious animation features ever made, dealing with war and death. It’s also very sad, bringing tears to the eyes of almost every viewer. Like ‘Animal Farm‘ (1954), ‘Le planète sauvage‘ (1973) or ‘Watership Down’ (1978), ‘Grave of the Fireflies’ is one of the few truly serious animation features, expanding the medium’s subject matter, and it’s a cinematic masterpiece by any standard. ‘Grave of the Fireflies’ was released as a double bill with ‘My Neighbour Totoro‘, which is equally classic, but very different in tone, indeed.